why is facebook stories so unpopular between users? "Stories" is a new, emerging feature in social media that the top social media platforms are starting to implement into their systems. Starting with Snapchat, many users are using Stories as a new way of communication. This rising popularity of Stories prompted other social media platforms, such as Instagram and Facebook, to implement the Stories feature as well. However, it's obvious that Facebook is falling behind. What about Facebook is making Stories not work on their platform? 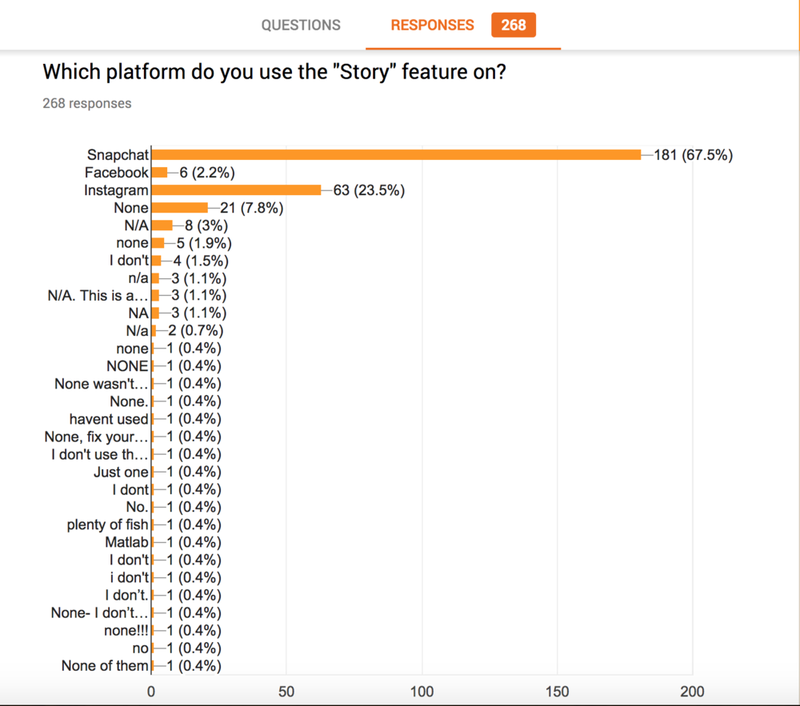 How can we get more users to utilize Facebook Stories? For this project, we were to explore three social media platforms and find a common feature that can be re-imagined for the future. After some extensive research, we had to find a solution and create a motion graphic demonstrating our process and solution. We started off with the question of "What is social media?" and found that it is "the creation and sharing of info, ideas, and interests via virtual communities and networks". An upcoming, new feature that facilitates this definition is the "Stories" feature. Many social media platforms are starting to implement this feature, such as Snapchat and Instagram, but from our personal experience, Facebook was falling behind. Only 2.2% of Facebook users use the stories feature, with Snapchat leading with 67.5% of users and Instagram with 23.5% of users. Snapchat, Facebook, Instagram each have their own personalities within social media. Snapchat is regarded as more private. Instagram is regarded as more personal. Facebook is regarded as more public. Snapchat is the original, and the other platforms are too similar for people to change platforms. 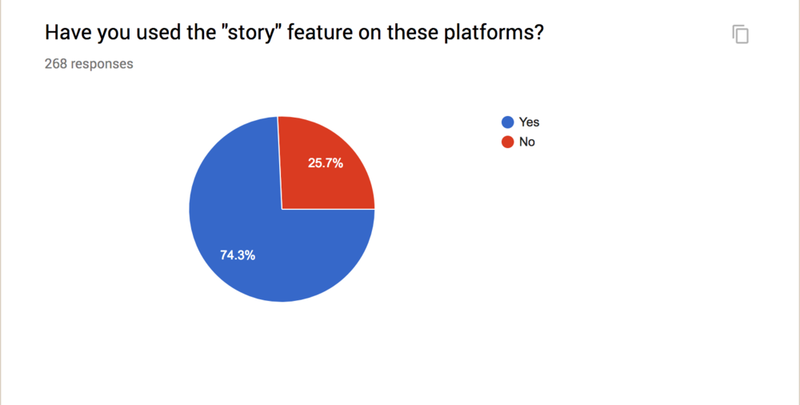 To find out why users tend to not use Facebook Stories, we conducted another survey specifically geared towards Facebook users. Facebook is steering away from user generated content and becoming a media platform. Facebook is too public because of the wide range of friends connections people have. People don't see the need to upload stories on Facebook, especially if they are using Snapchat and Instagram already. We also looked into the user flow of each platform's Stories feature, to see the route users have to take to get to the Stories feature. All three were very similar in their routes, except the way direct messages were sent. Facebook and Instagram directed you to their outside direct messaging section if you wanted to give feedback to a certain Story, while Snapchat sends a temporary message lasting 24 hours. After we narrowed down our problem, we tried to come up with a solution. We did a fast exercise called "Crazy Eights" where we had to make out 8 ideas in 8 minutes. 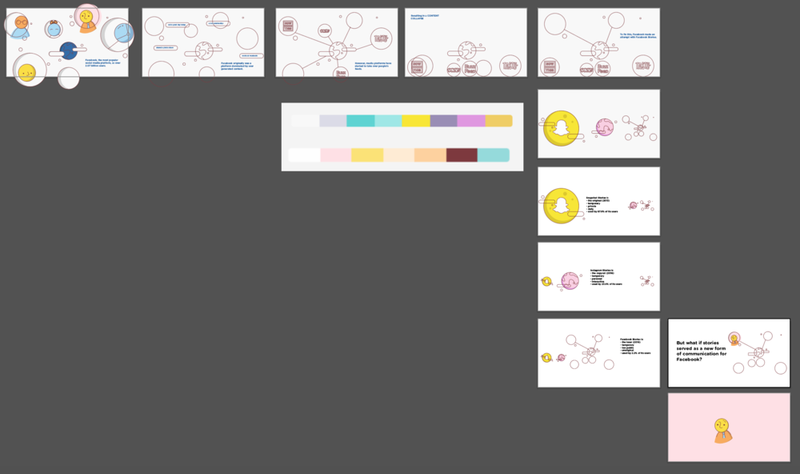 During this exercise, we made ideas that were separated into the categories of changing UI and re-purposing the Stories feature. 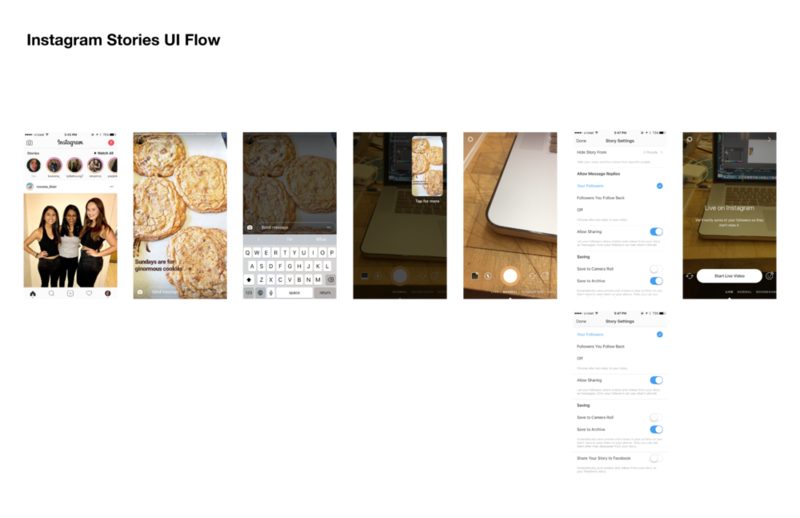 Some ideas that came about were making Stories just a Facebook Messenger feature, using Stories as a compilation of your own photos, and sharing content and activities on your own personal Stories. 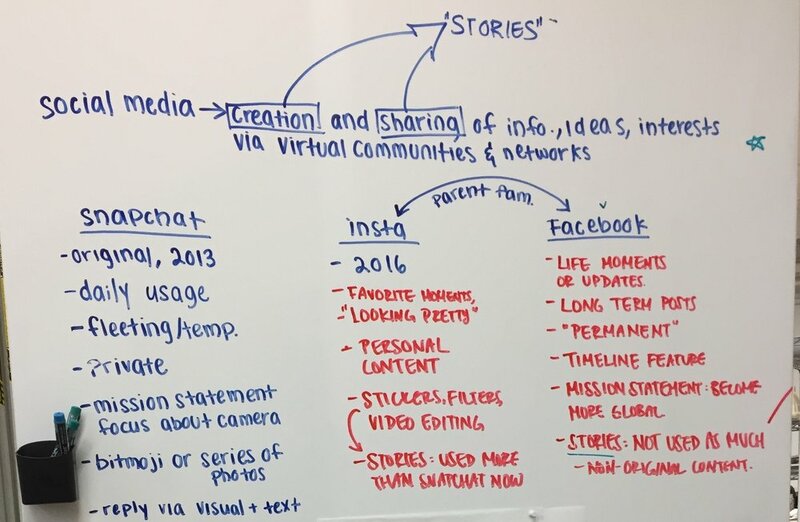 We were initially going to change Facebook Stories into a way people can share public content on, basically content that would come up on a user's news feed. This gives the Stories content a purpose for other people to look at your story, while not uploading too personalized content. However, we found that this facilitates Facebook's problem with content collapse, where public media platforms are taking over people's feeds instead of user generated content. To improve our solution, we decided to make Stories into a personalized curation of mutual interests between the user and their friends based on their activities (likes, comments, shares, posts), becoming a new form of communication between friends and acquaintances. This gives users a chance to have more personalized content on their Stories, but not too private for people to be uncomfortable of showing. Through this new feature, users will be able to use Stories to get to know people better, instead of a platform to post their own private content. After figuring out our solution, we were challenged to translate it into motion graphics into After Effects. How can we effectively visualize all of our findings into a time-based medium?